Important message to visitors: If you wish to contribute to the wiki, please include the characters "ELT" in your account name when you create one. This will help us identify that you are not a robot. Thank you! Widgets Inc. a finalist for the 2019 British Council ELTons! 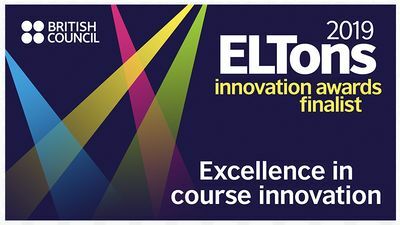 [2019 04/05] We are absolutely thrilled to announce that Widgets Inc. is a finalist for the 2019 British Council ELTon Award for Course Innovation! The ELTons are the very top international award in ELT publishing, sometimes referred to as "the Academy Awards of ELT"–and if so, Course Innovation is like the Best Picture category! Winners will be announced and livecast at a celebrity-filled ceremony in London on June 10th. Watch this space for more updates! Widgets Inc. is a business themed English communication course using a task-based approach to language learning. It is designed for classes of 12 to 40 young adult or older students who are placed into teams and must complete a series of connected projects. Students simulate being interns at a startup company called Widgets Inc., where they brainstorm product ideas, pitch their ideas, perform market research, design ad campaigns, participate in a job interview, and more. Widgets is great for mixed-ability classes from pre-intermediate to high-intermediate. CEFR B1 and above: students are engaged and challenged at their own level of achievement even while working together in mixed-level teams. Task situations provide useful language and excellent incidental practice for TOEIC speaking and writing components. Integrated skill development: students develop fluency and confidence in speaking, listening, reading, and writing via discussions, presentations, self and team evaluations, report writing, viewing video instructions, and many more highly-contextualized tasks. Meaningful assessment: students are assessed primarily by task outcome in accordance with Communicative Language Teaching and TBLT principles; a secondary focus on the use of language forms is also possible. Widgets is arranged by task complexity, not language complexity. The course starts with easy tasks, and quickly builds to more complex projects. This puts the focus and the challenge of the course on the practical use of English, rather than on passing language tests. It also encourages students to develop fluency and confidence in using English in ‘real world’ situations. This page was last edited on 4 April 2019, at 07:42.